Slim Vic – Exclusive mix for bejbi.se. The 56th of our series of exclusive mixes..
Click ”see the rest of this entry” to read more about Slim Vic and to download the mix. Behind the name Slim Vic hides audio-visual artist and concept creator Viktor Eriksson from Gävle, Sweden. Slim is perhaps best known as a DJ and founder of the visual team Deadpixel, but is also constantly involved in various concert and club events. 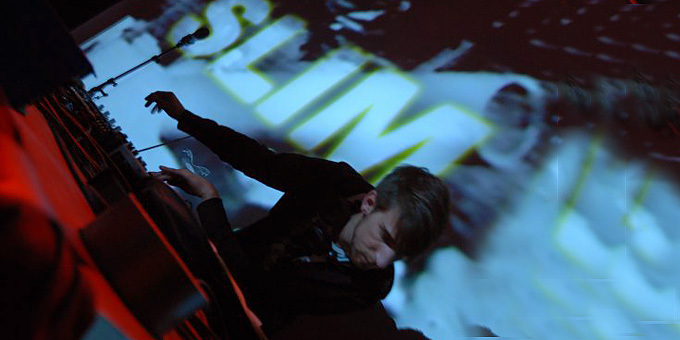 As a DJ, Slim has been active since the 90s and has played at such venues as; Arvikafestivalen, Dasboot, Norbergfestivalen and as warmup for example Ian Carey, Henrik B, Familjen and others. The music is always character-filled house and disco mixed with speed and with a razor-sharp precision. As a VJ he has performed at festivals and concerts around Europe as a resident for several electronic acts. As part of the visual team Deadpixel, several concepts has been created to clubs and festivals but also projects like art films and installations. In front of deadpixels visual club concepts, many artist has performed such as; Ozgur Can, Shiftee, Martin H, Tony Senghore, Style of Eye, Joel Mull, Dada Life, Flux Pavilion, Datsik and many more. In the everyday life Slim works as a project manager for IDKA, The Institute of Digital Arts, a job that provides insight into the wonderful world of film and art music. It also provides the ability to help people who wish to exercise their creative side. Viktor has arranged many concerts, and the PUSH festival which is one of Swedens biggest festivals of contemporary music. Some remixes and club tracks have been released in smaller labels over the years. Today the main focus is creating and producing music for live performances, movies, and mashups and re-edits to his DJ and VJ performances. Now he is the 56th out for a series of exclusive mixes recorded for bejbi.se by our favorite dj´s, both well known, and unknown, that we will publish once a week untill we run dry. Download Slim Vic’s Exclusive mix here (right click and save as) or listen to it live on Soundcloud or just press play below here. If you want to hear more of Slim Vic, check out his slimvic.net.